The industry leader in epoxy floor painting, fence painting, deck painting, and garage floor painting. We are a full service painting company serving Northern Illinois and the greater Chicagoland area. Specializing in deck painting, deck cleaning, deck staining services. 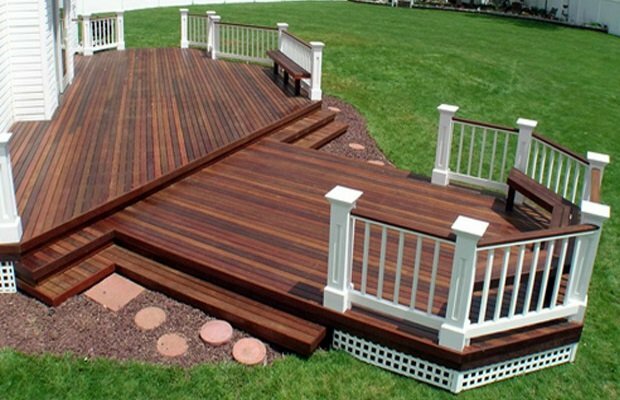 We paint exterior wood decks, fences, pergolas, arbors, playsets, walkways, gazebos, etc... NorthCraft also has a painting division that tackles floor painting. Installing epoxy floor coatings on concrete floors. We are a garage floor painting company, both residential floor painting, commercial floor painting, and industrial floor painting. If you need a floor painting contractor your search is over. Call today and get your project started. At NorthCraft Deck Staining Service, we take great pride in each and every deck painting job we do. For our deck painting customers, NorthCraft Painting Company offers uncompromising attention to detail, using only the finest, premium paints and finishes applied by skilled and careful craftsmen. Our understanding of the special needs of our deck painting customers is evident in the value-added services we provide, such as preventive maintenance painting programs, work and product specifications and recommendations, and even special work hours if needed. 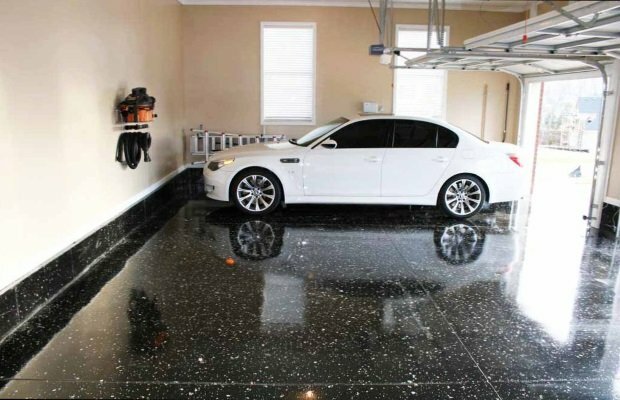 Whether you are a homeowner who always dreamed of a gorgeous showroom quality garage floor, a homebuilder needing exceptional flooring solutions, a car dealer or auto shop needing that new garage look or even an enthusiast looking to resurface a Warehouse. You need to hire the right floor painting contractor. Thanks to NorthCraft Painting Contractor, floor paintng has changed a lot in the last few years. NorthCraft Painting continues to lead the floor painting industry with flooring painting solutions that outperform mats, tiles, and other sealants. Epoxy makes the grade. We strive to create beautiful epoxy floor painting jobs. We also apply our skills to deck painting and cleaning. Both projects require professional skills, tools, materials, and some patience. There is no need for you to try and tackle a project like this on your own. We can handle any size deck painting project or epoxy floor painting. As garage floor painting or basement floor painting. We also paint industrial floors and commerical floors for businesses. We can handle all your painting needs. We are a professional floor painting company and deck painting company. We also paint fences, arbors, pergolas, garages, basements, workshops, and industrial areas. Our epoxy floor painting adds style to any area, is extremely durable, and quick to install. We have many floor painting options. NorthCraft Painting Services - Deck Painting Services - Fence Painting Services - Epoxy Floor Painting Services - Deck Painting, Garage Floor Painting, Floor Painting Company Serving Illinois and Chicagoland. By choosing NorthCraft Services you can get all of the painting services you need from one contractor that knows how to paint everything. Whether you need to have your deck painted or restored, epoxy floor painted or your concrete painted, we can do it professionally, on time, and on budget for any client. NorthCraft Painting Company - Deck Painting Company - Epoxy Floor Painting Company, Garage Floor Painting Company, Fence Painting Company, Deck Painting Services in Illinois and Chicagoland. Call us for deck painting, painting fences, industrial floor painting, epoxy floor painting, and garage floor painting. With painting services for everything around your home, commercial, or industrial facility, nobody can offer you a better painting solution. Best choice in Chicagoland for painting services for deck painting and epoxy floor painting. Please start your painting project today by giving us a call. Chicagoland Deck Painting Services, Illinois Deck Painting Company. Dont let your deck fade or gray, give NorthCraft a call today! If you are looking for a Chicagoland Epoxy Floor Painting Company then please call us at (630) 523 - 3045. Painting Company, Painting Services, Painting Contractor, Deck Painting, Deck Painting Contractor, Deck Painting Company, Deck Painting Services, Epoxy Floor Painting, Epoxy Floor Painting Company, Floor Painting Services, Floor Painting Contractor, Garage Floor Painting, Garage Floor Painting Company, Garage Floor Painting Contractor, Industrial Floor Painting, Industrial Floor Painting Contractor, Industrial Floor Painting Company, Industrial Floor Painting Services, Floor Painting Company. We are a Deck Painting and Epoxy Floor Painting Contractor.